Great Tastes Tuesdays! : Peanut Butter and Pumpkin! It is Friday! And today you get double duty! Two cookie recipes that are great and easy to make! 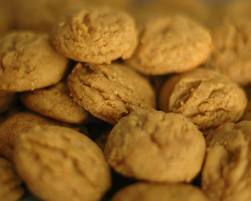 I just made these peanut butter cookies a day ago and they are all ready gone and I have had some request to make more. You don't have to take the time to measure out each different spice. In a large bowl beat your butter and peanut butter with an electric mixer until they are combined (about 30 seconds). Don't have your butter completely melted or it makes the cookie loose a lot of its shape. If you put it in the microwave to soften it mine only takes about 10 seconds and it is good. Add you sugar, brown sugar, baking powder, and baking soda. Beat until these are well combined. Beat in your eggs and vanilla and then beat in as much of the flour as your can with the mixer. Stir in your remaining flour and then stir in your oats, flour, peanuts, and peanut butter chips if you decided to use those. Drop by tablespoons on your ungreased cookie sheet. You don't need to grease it because peanut butter already has a lot of grease in it. If you do spray grease your cookies will spread like pancakes. Bake at 375 degrees for 10-11 minutes or until your cookies are lightly brown. Let them cool on a wire rack. *Note: if you freeze them overnight in a Ziploc container and pull them out in the morning, when they defrost they are moist. Mix the cake mix and pumpkin together well and then add in your chocolate chips. Spoon onto a greased cookie sheet and place in the oven. Bake at 400 degrees for 10-12 minutes and for higher elevations a minute or two more. Pumpkin is hard to tell if it is completely done, so if you don't bake them long enough they will be gooey. When they are plump they are up and rounded. Let them cool on a wire rack for 10 minutes and enjoy your cookies! Also watch this video from Rachel Ray. These tips for using your left over makeup are awesome!! So easy and so useful!